ATLANTA, GA…. 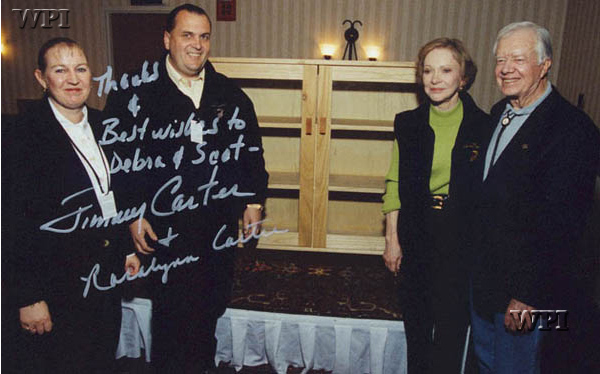 Former President Jimmy Carter and Rosalynn Carter’s eighth annual Winter Weekend and Benefit Auction was, by all accounts, the most successful ever. The combined totals from the silent and live auctions reached more than $532,000. Proceeds from the weekend will go to the nonprofit Carter Center. The highlight of the auction was the sale of President Carter’s handcrafted display cabinet made from paulownia trees grown on his farm near Plains, Ga. The cabinet, accompanied by a photo album with President Carter’s handwritten descriptions of the step-by-step building process, generated fast and furious bidding. When it was all over, the cabinet was sold for the respectable sum of $230,000. A rare color photo of five presidents – Nixon through Bush – and six first ladies – Johnson through Bush – went for $30,000. A one-of-a-kind memory chest, donated by premier woodworking artist, Vern Hartvigson, sold for $50,000. The chest is made of white oak wood from Mrs. Carter’s family property and post oak wood from President and Mrs. Carter’s farm. The post oak wood rings seen in the chest’s inside tray indicate that the tree was pre-Civil War. A small vial of soil from the roots of the white oak tree and a plug of wood salvaged from the home where Rosalynn Carter was raised were included. Ten high school students from Futureforce, a program administered by Communities in Schools and the Department of Defense, joined the Carters on the trip. Created to help at-risk teens develop leadership and life skills that can be applied to their day-to-day lives, Futureforce students have been part of the ski trip since its inception in 1993. The teens, many of whom saw snow or rode in an airplane for the first time, will be profiled in a special hour-long episode of Mindbusters on Atlanta WPBA-TV 30 on March 23. Founded in 1982 by Jimmy and Rosalynn Carter, the nonprofit Carter Center strives to relieve the suffering of those who live in life-threatening circumstances caused by war, disease, famine, and poverty. The mission of the Center is to wage peace, fight disease, and build hope around the world. Apart from being the Worlds largest producer and supplier of Genetically Superior Paulownia varieties WPI’S scientific team of geneticists and silviculturists continue research and development of Paulownia varieties, complimentary forestry trees and crops that can be incorporated in WPI’S managed large scale reforestation and agro forestry projects.